Last week, I wrote a piece about the terrible, horrible, no good, very bad week America was having in the aftermaths of the state-approved murders of Alton Sterling and Philando Castile and the subsequent killings of five police officers in Dallas, Texas, amid a peaceful protest of those killings. In this piece I pointed out how Black men and boys in particular, are targets and that our bodies have been criminalized by America. In the comments of this piece, a few people, specifically women, made it a point to note that Black women shouldn’t be erased from the conversation, but constantly are. While the preponderance of these cases of state-sanctioned murder do involve Black men (and boys), Black women are not immune from death-by-cop. Several women are among the unfortunate ranks of dealing with the police and ending up on the wrong side of the equation, i.e. Sandra Bland, Rekia Boyd, Michelle Cusseaux, and the list goes on. While those stories remain part of the narrative and are well-known to those who are fervently involved in the fight to prove that Black lives do matter, the larger conversation centers around these deaths as a battle between the police and Black men. It is important to note that while understandable, it is wrong to paint this ongoing tragedy as solely an epidemic facing Black men and our bodies. While nearly every person with common sense knows that isn’t the case, the way we write about it and discuss it in the media, even with the best of intentions, does lean towards an erasure of the pain and death that Black women also face in the midst of it all. The death of one Black person, man or woman, is one more than should happen in these circumstances. Thank God for video. From where I sit, Black women are in the same boat as Black men. The way that officer in McKinney, Texas manhandled that teenaged Black girl, as an example, proves to me that, in the eyes of law enforcement, Black bodies are one and the same, no matter the gender or age. Seeing that video was jarring, not just because of what I saw, but what it represents: an institution that believes that even a little girl in a bathing suit, clearly without a weapon or ability to harm a grown man with a gun, is to be treated like a man with gun pointed at an officer. The message is loud and clear; all Black people are to be feared and treated as a potential threat to police officers. While I, like many people, view Black men as the primary targets of the wrath and rage of the American judicial system, the fact is, if a Black woman ends up in the same situation as a Black man, and the perceived questioning of authority exists, she may very well end up being the next hashtag, simply because that police officer sees the perceived disrespect of a Black person as an affront to their state-sanctioned authority. To pretend like it’s not the case would be unfair and flat-out inaccurate. Not giving women their due in the conversation is even more ironic considering how many Black women are at the forefront and are founders of the various movements intended to ensure that Black lives matter. Black women feel the burn of institutionalized racism just as painfully as we do. Black lives being gunned down by the power structure affects us all; it’s a public health issue that threatens our communities. If the police keep picking off members of our community, even when we're obeying the law, what community will we have left? We can’t expect women to be at the forefront of these movements without acknowledging that they’re not just there to support men, but because they also feel the same sting and same circumstances that we do. 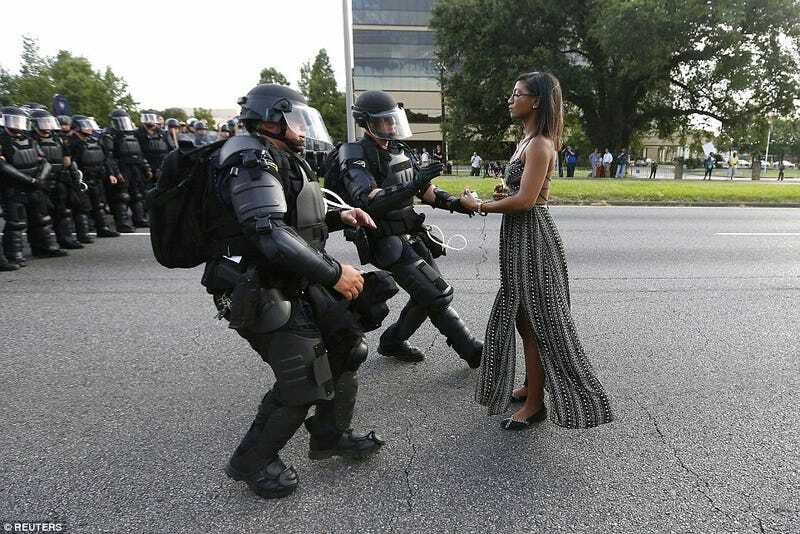 The recent picture of Ieshia Evans (top of the piece), standing tall and serene while the two police officers look prepared to face off against a full scale riot, speaks truth to this power. This Black woman from New York City came down to Baton Rouge to stand against the enemy and did it in the way only a Black woman can, often silently, but as powerfully as any man. She’s there for many reasons, but mainly, because what happens to the Black community in Baton Rouge affects the community in New York City, St. Paul, Minnesota, Ferguson, Missouri, Chicago, Illinois, and anywhere else we are. The picture is powerful in that it shows the stark contrasts in demeanor and purpose. Ieshia is stoically and peacefully asserting her right to be there while the police officers are in action mode against the Black body at rest. I’d like to call it the irresistible force paradox, but we all know how this story ends. Luckily because of the circumstances, it only ends with her in jail. Black women are front and center to this movement because they have to be for their own good. Institutional racism affects all of us. Our community can’t thrive unless Black men and women recognize and acknowledge each other in it. It’s the only way to achieve real progress. Because some cops may be gunning for Black men, but a Black woman will do.